One Texas artist is making waves and getting national recognition with his bold, colorful paintings and murals. Artist Michael Savoie, a native of Port Arthur who recently moved from Houston to Dallas, was selected as a Top 3 Finalist and finished as the first runner-up in the 5th Annual Bombay Sapphire Artisan Series competition, in partnership with Def Jam co-founder Russell Simmons' Rush Philanthropic Arts Foundation. 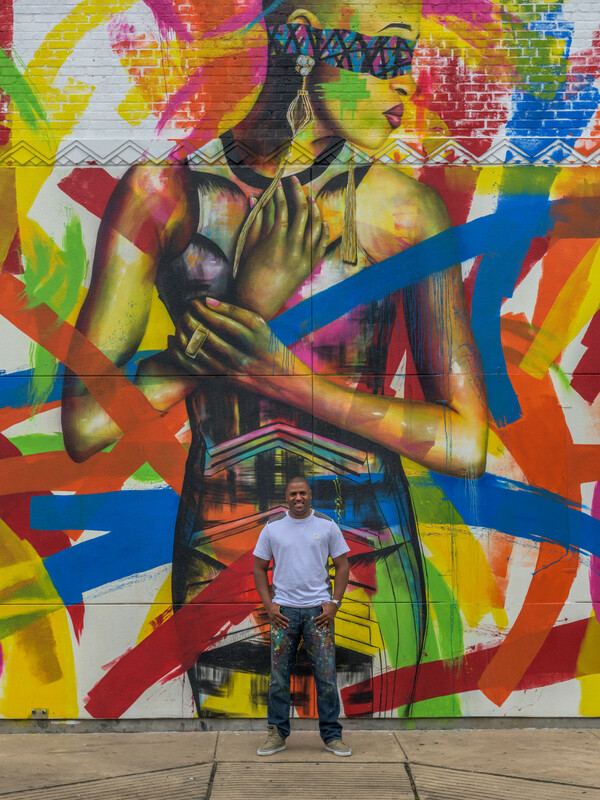 Along with Andre Guichard, national art curator for the Bombay Sapphire Artisan Series, Savoie unveiled his massive public mural — located at Smith St. and Elgin — in a ceremony last week. "I chose a model that broke away from the typical view of what beauty should be," Savoie said. Savoie's work, which he describes as "abstract realism," has been featured in Fox's wildly popular show Empire, where his large portrait of Tianna — one of the singer's on the "Empire" label — dominates her apartment and appeared in a number of episodes. One of Savoie's pieces has also appeared in an episode of the reality show Real Housewives of Atlanta on Bravo. Savoie said he hoped to celebrate the beauty of diversity in the Houston mural, which he completed in a week. "I chose a model that broke away from the typical view of what beauty should be. Although she is African American, she has a very Euro look. The short hair and androgynous look works for my approach in that it creates a silhouette that is sleek, stylish and bold," he explained in a statement. "Her gaze to the side and pose is quite introspective and presents more of a question instead of a statement. She stands as a very regal, statuesque kind of figure, which is where the inspiration comes from. I wanted to present an image that would stand as an icon in the community." He projected the portrait onto the wall and using spray paint and freehand detail to complete it. The Bombay Sapphire Artisan Series competition Grand Finale Winner was San Francisco artist Kristine Mays, winning the opportunity to showcase her works in front of the world's top art critics and buyers during Art Basel Miami at the Scope Miami Beach Art Show. New Orleans Artist Ti-Rock Moore rounded out the Top 3 Winners. Now in its fifth year, the Bombay Sapphire Artisan Series competition has received more than 15,000 submissions and more than $260,000 of artwork by competition finalists has been sold.